On Sunday, December 2, 2018, Jamaica's Dalton Harris etched his name in the history books after winning the prestigious UK Talent Show, XFactor. It was probably on the cards after scintillating performances leading up to, and during, the final night though. He eventually topped the award over Scarlett Lee, Scouser Anthony Russell and many others. Dalton, from the community of Sanguinetti in Clarendon is twenty–four years of age, born December 29, 1993. He reportedly has twenty-two brothers and sisters, between both parents. His youngest sibling being eleven years of age at the time of his award. He attended the Sanguinetti Primary School and later Edwin Allen High and Kingston College. Dalton grew up poor without electricity or running water in a one bedroom house. This has also been part of Dalton’s motivation to change his destiny. As he said, “it’s not a sad story, but more-how I came out”. He had declared himself victorious over his beginning. This is not the first major competition win for Dalton though. Here in Jamaica, the most popular talent search, Digicel Rising Stars, was won by Dalton when he was only sixteen (16) years of age in 2010. For that he won a million Jamaican dollars (nothing close to his X-Factor £1 million) and later released three albums. He was managed then by Donovan Germain (CEO of Penthouse Records and former manager of Buju Banton). Germain mentored Dalton for some time and Dalton noted under his guidance that he wanted a university education in psychology, as he understands the importance of education. Dalton's first single, released in 2014, was Pauper. Five years ago Dalton went to the United States from Jamaica to improve his opportunities but did not meet the success he wanted there. He recently went to England for the 15th series of the XFactor talent competition and the rest is history! From the beginning to the end, Dalton delivered soulful performances. Audience members felt he really meant the words that echoed in each song. His first song 'Sorry' was emotional and even made Simon remarked, “I will never listen to the song the same way ever again”. Dalton has the tendency to go into falsetto which adds to his songs and makes the experience even more surreal in a very good way. The Prime Minister Of Jamaica, The Honourable Andrew Holness, tweeted, @drealdaltonharris “congratulations, the entire Jamaica is proud of you. Your phenomenal talent is unleashed on the world”. I do believe that his coach, Louis Tomlinson did an excellent job (kudos!) In fact, Dalton got more than just the regular votes when Duchess Sarah Ferguson (royalty) invited him to her tenth anniversary of Charity Street Child and was blown away by his performance. She remarked, “I will adopt him”. Many predicted Dalton's eventual victory. 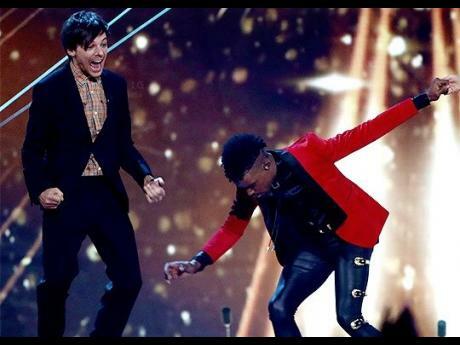 His main support was from the judges: Louis Tomlinson (coach), Ayeda Williams, Louis Walsh and Simon Cowell. He won singing 'the Power of Love' with James Arthur. Vloggers from youtube praised Harris’ last performance with Emelie Sande as the real deal maker. Dalton’s ease in the rendition showed his growth in confidence as he delivered what some have termed “a beautiful rendition to someone else”. Dalton has smiled on the stage of stardom using the steps of a globalized techno world. Indeed a victory worth celebrating but more importantly lessons for us to learn. Dalton followed the advice of Donovan Germain after winning the Digicel Rising Star and earned six CSEC subjects as he needed to be able to represent himmself well. Dalton reportedly lost his prize money after the Digicel Rising Stars competition in 2010 but still decided in 2014 to release Pauper, three albums and enter the X Factor in 2018 - his biggest break to date. Dalton tried five years ago to regain his career by going to the US but it did not work. Dalton watched the XFactor for seven (7) years before entering what now became almost a sure win. Dalton said… it’s not a sad story but more how I came out. I’m triumphant. All of us have adversities in life that seem daunting at times. Don’t make your life a sad story but stay humble, get up even after falling, be determined and stay positive at all times. The following are some of Dalton Harris' most notable 2018 XFactor performances. So what do you make of him and these performance? How further do you see him going? Please be sure to share your comments with us below. I can't wait. What can we say of Jamaica?